Most attention, of course, focuses on “new” from Disney/Marvel/Star Wars, Nickelodeon, Warner, Turner, spinoffs, reboots, and so on. But here are some notes on two of the odder newbies, a new digital hit (Bethany Mota; more on digital properties in an upcoming post), collaborations, distribution strategies, and more. Will the newbies be back next year? Stay tuned. Opportunistic Anime. John Prine and the late singer/songwriter extraordinaire Steve Goodman set out to write the perfect country and western song by including every country song cliché they could, including mama, trains, trucks, prison, and being drunk. The result was “You Never Even Call Me By My Name,” which was a country hit for David Allen Coe in 1975. I don’t know if the folks at Genco, part of the Daisuki Anime Consortium Japan, have heard the song or would get the joke (most of the clichés are bunched up in one final verse), but they were at Licensing Expo concept-testing Sushi Ninja, who “fight with evil Monsters for justice every day.” While they fight largely over silly things, there are only three episodes so far. Not sure it’s really for kids, or whether the humor can hold up over a full season, but so far it’s pretty funny in a SpongeBob-by sort of way. Flush Here. Jim and Dan Chianese are brother podiatrists in Blacksburg, VA, and Charleston, WV, respectively. They are also the inventors, if you will, of Toilet Babies, a line of five (so far) “characters” that reside in Kalimapoo. You probably get the idea already. If not, go to their website. 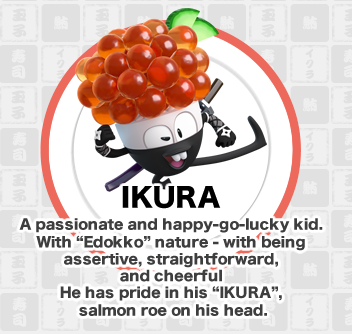 Each character has his own backstory — and yes, they are all male. 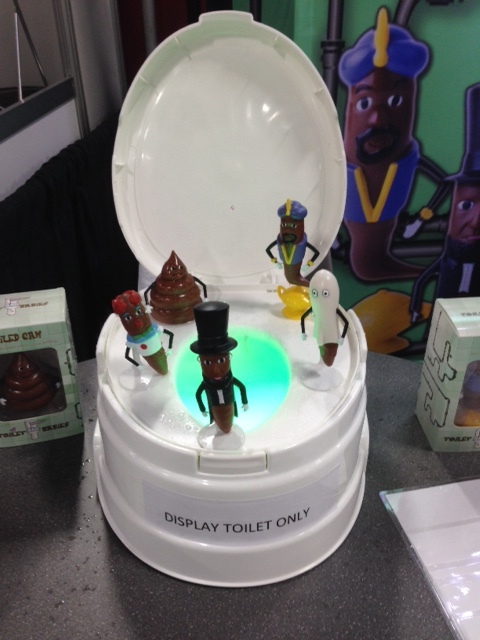 Toilet Babies characters include Lincoln’s Log and Spooky Dooky, among others, at $12.99 each. Bowl not included. The brothers sourced 2000 of each character in China, have interest from a distributor for Japan, thought the line would appeal to 3-8 year-olds but have found the range is more 18-40 (in part, no doubt, because the only way to purchase them is online via credit card or PayPal), and exhibited at Toy Fair West and Licensing Expo in search of unloading the concept (sorry) on licensees. “We’re doctors, and we figured we’d follow the motto we follow in our practices: ‘What you don’t know, ship out.’ That’s where licensing comes in.” Contact: dnjcollectibles@gmail.com. Learning to Fly on the Fly. When Aeropostale decided to launch an exclusive line around digital celebrity Bethany Mota, it was “two months from agreement to stores,” early in December 2013, in order to make the holidays, says the retailer’s Scott Birnbaum. Aeropostale is making 8-12 deliveries a year on the line, and when Mota makes live appearances (25 “meetups” so far, attracting 2500-3000 each, on average), she has to change outfits several times because the stores sell out instantly of whatever she wears. Making Lemonade Out of… Animaccord VP of Licensing Vladimir Gorbulya, representing the popular Russian property Masha and the Bear, which launches dubbed in English in the U.S. on Netflix this August, says they “don’t want to crowd the market with episodes.” They have 51 short-form episodes of the core series (it would take three to fill a half-hour U.S. slot on broadcast or cable). There are two spinoffs: Masha’s Tales and Masha’s Scary Tales. The program already has a strong YouTube following in the U.S. European toy chain Hamleys features Masha in a store-in-store concept in Russia; next up will be Italy. (The property does not show up on Hamleys’ English-language website.) Animaccord issues 2-3 stylebooks annually to keep the property fresh. Sound the Trumpets. Signage at the Fox booth at Licensing Expo heralds Ice Age having amassed $1.4 billion in merchandise sales (cumulatively, worldwide), with 2.5 million books in print. . . .Fox figuratively threw its trademark searchlight on exclusive retail and design collaborations including Simpsons x Joyrich, Simpsons x MAC, Home Alone x Rook, and others in signage adorning the outer walls of its booth. . . .Authentic Brands Group (ABG) hardly needed more than the giant TV over the entrance to its booth, what with a running loop of images featuring properties it owns and represents, including Muhammad Ali, Marilyn Monroe, Michael Jackson, and Elvis Presley. Nice Touch. Kudos to Advanstar for adding a “character parade” the opening day of the show. Several dozen characters wound their way slowly through the aisles, making for plenty of smiles and some neat once-in-a-lifetime photo ops. 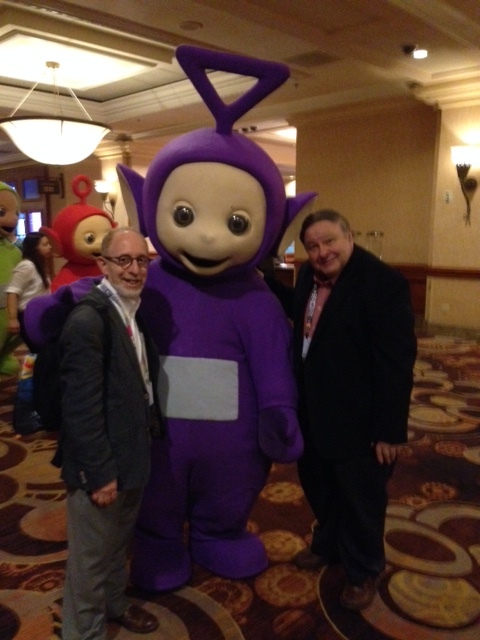 On their own, The Minions were especially popular at Universal’s booth, while the Teletubbies made an appearance at the LIMA Awards festivities. 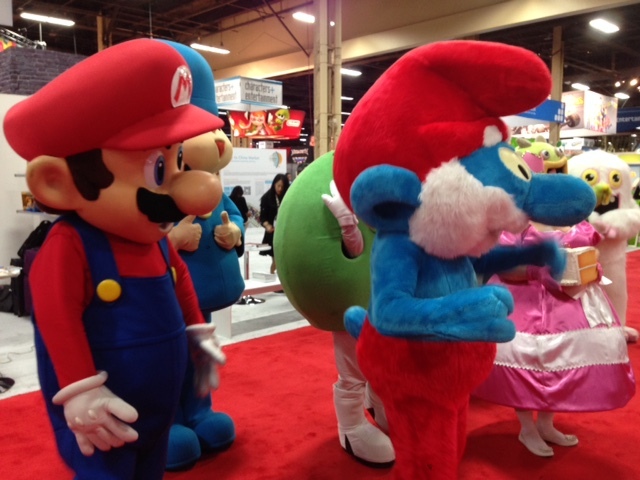 The character parade made for some strange bedfellows. LIMA General Counsel Greg Battersby and mystery guests at the LIMA Awards ceremony. 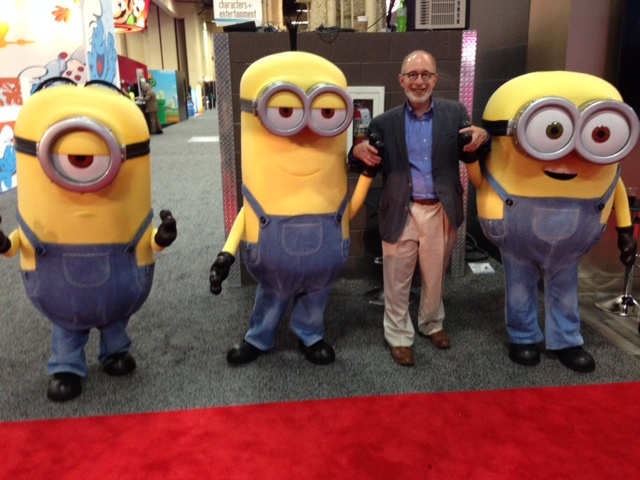 Your humble reporter befriends the Minions.